Because Antoine had beautiful handwriting, his superiors repeatedly asked him to complete calligraphic work. When the postal service, and specifically the State Secretary of the Imperial Postal Service, Heinrich von Stephan, noticed Antoine's images representing postal workers and their environment, he was transferred to Berlin in 1891 with the intention to make optimal use of his artistic skills, which was not possible in the province. He first worked at the Postal Service’s headquarters in Berlin, then temporarily in the technical site office of the Reich’s Postal Service. Here, he created watercolor paintings of building facades and perspective views of postal service buildings. That brought about Stephan's particular liking of him, considering that in 1878, Stephan had ordered documented watercolor paintings of the large mail and telegraph buildings built under his leadership. On April 1, 1902, Otto Antoine was appointed the Bureau Assistant at the Postal Museum by Stephan. He was asked to assist with the organization of the museum. He was tasked to create representations of writing people, offices, messengers, postillions, postal cars, ships, etc. based on illustrations selected by the museum fromancient manuscripts and books to improve the collections with an artistic component. 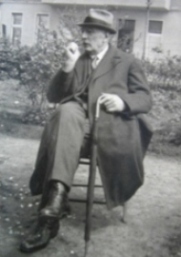 He copied and colored – like Karl Hoffacker (1856-1919) before him – the reproductions produced from photographs or collotype prints that were printed by the Reichsdruckerei (“Reich’s printing house") and traced colorful initials or faded captions in old German letters. Otto Antoine had been friends with the painter Hans Hartig since after a stay in Neuwarp at the Baltic Sea in 1916. While Hartig, who previously preferred painting landscapes and the Baltic Sea, began painting metropolitan motifs as a result of his friendship with Antoine, he managed to interest Antoine in motifs of the Baltic Sea. Antoine created a permanent memorial of his friend when he depicted Hans Hartig painting at the harbor of Neuwarp in his painting. Among the artists who were friends of Otto Antoine were several other “postal painters,” such as Richard Albitz (1876-1954) and Gustav Fenkohl (1872-1950), who had evolved from Berlin’s art scene. All his life, Otto Antoine was loyal to impressionism. His style barely changed after his training under Skarbina, not even when an “art revolution” occurred in Berlin in 1905 introducing expressionism in lieu of impressionism. Under the pressure of the government’s supervision of culture in 1933, he created more realistic paintings like most other artists did, too. In 1893, one of Antoine’s works was exhibited for the first time in the National Exhibit located at the train station in Lehrte a part of the Greater Berlin Art Exhibition (“Grobeka”), followed by an oil painting in 1894 (“Es dunkelt…” [“It darkens…”]). After democratic pluralism found its way into the officially supported art of Berlin after the end of World War I and the artist associations (Association of Berlin Artists, Berlin Secession, Free Secession, and Novembergruppe) for the first time provided a comprehensive overview of the artistic work in Berlin, Otto Antoine and Hans Hartig, the members of a jury founded for this purpose, represented the interest of the Association of Berlin Artists. 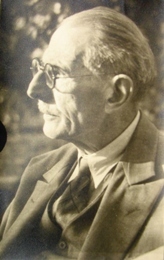 Antoine joined the Reichskulturkammer (Reich Chamber of Culture) after it was established by law in the fall of 1933 to be able to continue working in his profession. Recognition and orders increased as Otto Antoine became more famous. Museums, public and state-funded institutions, private art enthusiasts and collectors purchased his works. In addition, he gained more popularity as his paintings were printed in calendars and a large number of postcards with his depictions of postal motifs were circulated. Several of his works were lost in the turmoil of World War II. Among those were 24 oil paintings with depictions of roads, bridges, and places in Berlin which were considered important historic paintings and were stored by the city of Berlin and brought to Warthegau in the Polish territory to protect them during the war. Another missing piece is the painting entitled “Leipziger Strasse” that had been removed from the inventory of the Berlin National Gallery and was last located at the museum in Gliwice in Upper Silesia. Fortunately, a large amount of his work had been preserved. However, a complete overview of the locations of Antoine’s works does not currently exist. At best, the following information may be a reference point. A large number of his works is currently kept by the family and other private collectors. The paintings Antoine created for the Postal Museum and some other works the Postal Museum acquired after World War II are currently on exhibit at the Museumsstiftung Post und Telekommunikation. This includes primarily 22 oil paintings and 16 watercolor paintings as well as drawings and colored facsimiles. The foundation Stiftung Stadtmuseum Berlin is in possession of four paintings which were previously owned by the town (“Sicherheitspolizei in Berlin, 1920” [Security Police in Berlin], “Kaiser-Friedrich-Brücke, 1921” [Kaiser-Friedrich Bridge], “Leipziger Platz, 1925”, “Am Potsdamer Platz, 1930” [At Postdamer Platz]) and two graphics by Antoine. The museum Deutsches Technikmuseum Berlin owns the painting entitled “Überführung der Hochbahn zu Berlin über die elektrische Vorortbahn und Fernbahn“ (Overpass of the Elevated Train Near Berlin Above the Electric Commuter Line and Railway”) (presumably around 1905) with a yellow postal vehicle at a rail triangle. 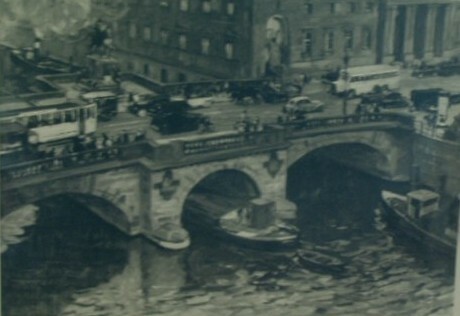 Antoine’s oil painting from around 1920 of Berlin traffic at Alexanderplatz, which was built in 1882, is located at the Berlin District Office of Reinickendorf. 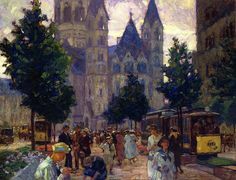 The company Rhein-Chemie Holding in Heidelberg owns a collection of watercolor paintings featuring views of Berlin (29 were on exhibit at the aforementioned exhibit Alt-Berlin shown in the picture to mark the 100th birthday of the artist). Antoine lost his home and studio located at Weimarische Strasse 2 in Berlin where he had lived with his family for over four decades in 1942 due to repeated bombings. For a short time, he and his wife went to Silesia, but then moved to Unteruhldingen at Lake Contance in the summer of 1944 to regain their footing. During this time, the materials the painter needed for his work were in short supply and required ration coupons. Antoine contacted the State Culture Administration Gau Berlin on December 31, 1944, because the leader of the Reich Chamber Fine Arts of the State Culture Administration Gau Baden in Karlsruhe, who was responsible for the region were Antoine lived, was no longer able to work. Antoine’s attempt paid off. He received his last ration coupon for some supplies on January 10, 1945.